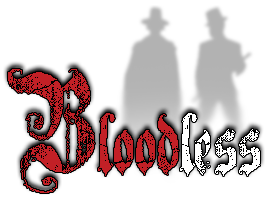 After a stint in Toronto with Theatre 20 last year, the skyrocketing BLOODLESS is currently playing in Winnipeg, produced by White Rabbit Productions. I had the pleasure of seeing the show for the first time last week, and it certainly is a fun little adventure with a lot of very clever ideas, and great possibility for future productions. Probably most exciting to me is the use of the chorus, and the fact that it is a fairly large cast musical. The show is fantastically directed by Sharon Bajer, with some great choreography from Kim Rampersad. The show is playing at Cercle Moliere Theatre in St. Boniface until May 4th, get out and see it while you can.